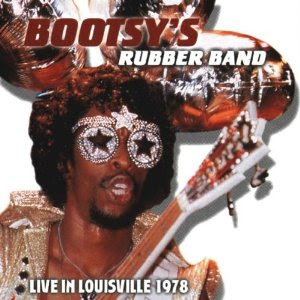 "If Bootsy Collins is correct in his contention that faking the funk will cause one's nose to grow, he and his bandmates need not worry: This is one seriously funky live album. In fact, fans of Collins who know him only through his studio recordings will find this set revelatory. There is a ferocity here that is only hinted at on his solo efforts and his work with Parliament and Funkadelic. Collins' vocals throughout this 1978 concert recording are frighteningly powerful, and his always amazing slap bass playing is almost dizzying at points. The rest of the group aren't slouches either. Of course, this is no second-tier road band: All of the key members of the Rubber Band are on board as are most of the Horny Horns (with the obvious exception of trombonist Fred Wesley). Collins and company cover all of the obvious hits and crowd favorites, and in every instance they improve on the already impressive studio versions. Gary "Mudbone" Cooper's vocals shine throughout as do those of Robert "P Nut" Johnson. Collins' brother, guitarist Phelps "Catfish" Collins is strong as always, particularly on incendiary versions of "Very Yes" and "I'd Rather Be With You." The horns -- always among the highlights on the Rubber Band's studio recordings -- are particularly effective here. Check out Maceo Parker's solo spot on "Can't Stay Away" for definitive evidence of his genius. This European release may not be the easiest item in Collins' discography to locate, but it may well be the best. Well worth seeking out." Nice share!Thanks for this great album!